Steamboat is actually a complete mountain range: Mount Werner, Sunshine Peak, Storm Peak, Thunderhead Peak, Pioneer Ridge® and Christie Peak. 2,965 acres (1200 hectares) of permitted terrain offer a diversity of trails for all levels of ability. Mavericks Super pipe is a freerider's dream. Mavericks is 500 feet long, 56-feet wide, has 18 foot walls, and a 22 foot radius. Steamboat's SoBe terrain park adjacent to Mavericks, features an outdoor sound system, a variety of rails; kinked, sliders, rainbows, "S", mailboxes, double barrel, and Mini-Mav, a miniature version of the superpipe with five-foot walls, perfect for novice riders. Gladed areas of Pioneer Ridge, Sunshine and Storm Peak are Steamboat's particular claim to fame, with Champagne Powder® snow in the trees for the most avid powder hounds. Vertical Rise: 3,668 feet/1118 meters - Second highest in Colorado! *Package pricing subject to change based on available airfares. Air Package – Includes round-trip airfare from Atlanta to Denver, Bus transfer from Denver to Steamboat, five nights lodging at Canyon Creek (*Maximum Occupancy) and a 4 day lift ticket. Ground Package - Includes Bus transfer from Denver to Steamboat (*You must arrive at the Denver airport prior to the bus departure. If you are not at the bus departure point on time the bus will not wait and you will be required to find your own transportation to Steamboat), 5 nights lodging at Canyon Creek, a 4-day lift ticket and a group dinner. A $100 non-refundable deposit is due at the time of registration in order to guarantee your spot. A second payment of $400 will be due by October 24. Final payments will be due by November 20. For best pricing, Air Packages must be confirmed before October 24. All equipment rentals and other add-ons fees will be collected with the final payment. Registration - Registration is first come first serve and can be completed online by clicking the link above. 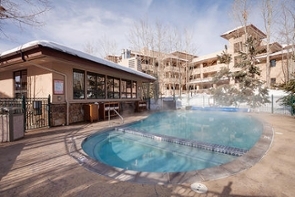 We will be staying at Canyon Creek in Steamboat Springs. Located at the base of the Steamboat Ski Area in the exclusive EagleRidge neighborhood just 200 yards from the gondola, Canyon Creek offers luxury condominiums featuring beautiful kitchens with granite finishes and open floor plans. Each unit features a large private balcony, gas fireplace, and washer and dryer. Ample amenities abound including a heated outdoor pool and hot tub, free Wi-Fi, state of the art fitness room with flat screen TVs, heated underground parking and ski lockers, and is located on a walking trail that winds along the idyllic Burgess Creek to the nearby Wild Plum Market and to the ski area. There is a front desk on-site at the clubhouse where guests can also enjoy an espresso & cappuccino bar and weekly Manager’s Receptions during the ski season featuring complimentary beverages, appetizers and good company. A winter shuttle service will whisk guests away to shopping, dining and the ski area. You will be required to sign a form stating that you will be responsible for any damages to the condo during our stay. Never Skied or Boarded before? Steamboat has one of the finest learn-to-ski programs in the country. Amazing deals on first time ski lessons are part of this package as well. If you are interested please contact the outdoor program office.